Create a digital exhibit to replicate marine life at the entrance of the Georgia Aquarium in Atlanta – to deliver a visually stunning and interactive experience for visitors. LG’s amazing display of innovation came to life with its commercial-grade Full HD Video Wall, featuring a narrow bezel-to-bezel width and ﬂexible conﬁgurations, allowing for multiple displays to be daisy chained. The Georgia Aquarium created a lifelike digital exhibit with LG video wall displays that were creatively placed within an emptied aquarium tank, providing visitors with engaging and effective entertainment platforms, exceptional picture quality and an immersive experience. The Georgia Aquarium is the second largest of its kind in the world, housing thousands of ﬁsh, mammals and amphibians on display within six galleries. During an intensive restoration project in which one of its galleries would be completely reconstructed, the Atlanta-based aquarium wanted to continue to engage visitors in the gallery and keep visitor ﬂow as streamlined as possible. Aquarium executives turned to LG Electronics for a digital signage solution to recreate a live exhibit with video wall displays capable of delivering superb picture quality during the construction. The Aquarium installed 36 LG 55-inch Full HD Video Wall Displays (Model 55LV77A7B) inside an emptied acrylic aquarium, which formerly housed the “Wall of Fish” exhibit. 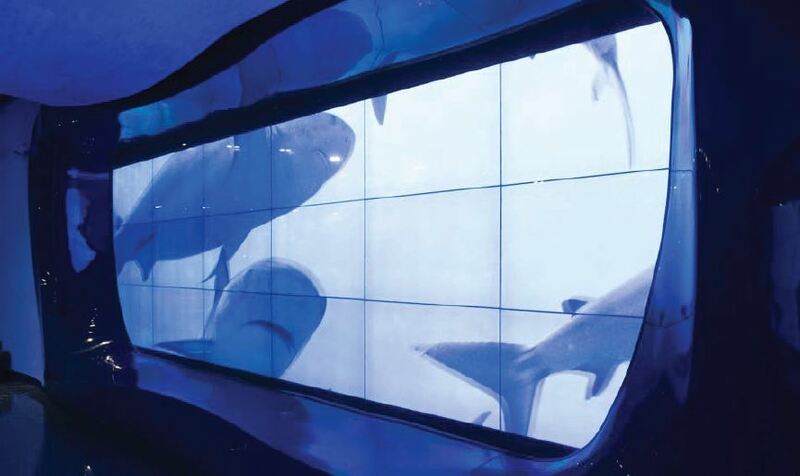 With the LG products’ stunning lifelike picture quality and immersive experience, the video walls provided the aquarium’s more than two million yearly visitors with an entertaining visual experience on par with a live exhibit. The installation process faced several unique challenges, namely the space allotted for the video walls. The in-house audio/visual team installed the 36 LG displays, in two 6×3 matrices, inside the former ﬁsh tank that measures 16 feet deep and is separated by a partition in the center. The tank only allowed ﬁve feet of working room to install mounting structure, brackets, power, data and displays. With this limited space, the team was challenged to install product without damaging the tank and its waterproof design. The team implemented a ﬂoating support system that uses carpet pads to protect the product and the acrylic wall on which they are installed. The LG displays were carefully lifted and lowered into the tank given the narrow conﬁnement, and then mounted with Crimson video wall mounts. A key beneﬁt of the displays is their light weight – only 50 lbs. each for easy installation. To achieve the picture quality and operational reliability desired, the aquarium chose the LG 55LV77A-7B to display Full HD 1080p content on each display. LG’s IPS panel technology ensures excellent color saturation and contrast, resulting in a display with superior picture quality that can be installed at virtually any angle or height, while still maintaining the integrity of the image. Designed for continuous operation in a public setting, the video walls’ IPS technology provides a temperature tolerance of up to 230° Fahrenheit (110° Celsius). This helps alleviate a common overheating problem that affects picture quality with some other digital signage screens. The Georgia Aquarium controls the LG video walls using a RS-232 system to operate 11 hours a day. It automatically powers on the video walls 30 minutes prior to the aquarium opening, and powers off 30 minutes after closing. The video walls became an integral solution of the signature experience the aquarium offers, which is grounded on entertaining, engaging and educating. The video walls have also been well received among staffers, as they require very little maintenance, a testament to LG’s amazing display of reliability. “The LG video walls are the ﬁrst visuals that our visitors see when they walk into the Georgia Aquarium. It was imperative to choose the right signage and above all, the right partner, that could work with us to display our content and maintain a high quality experience for visitors,” concluded Palley.